Monday, June 9, 2014 – I’m just back from breakfast, sitting in bed, looking forward to having nothing to do all day except sleep, catching up on my thinking, and planning my upcoming travel projects. 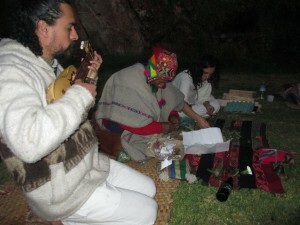 Perhaps, capturing in words a report on this weekend’s “Condor Prayer Ancestral Medicine Retreat.” It seems very hard to quantify this Andean CosmoVision, San Pedro Ceremony held in the vicinity of Paz y Luz Healing and Conference Center, here in Pizac, Peru. 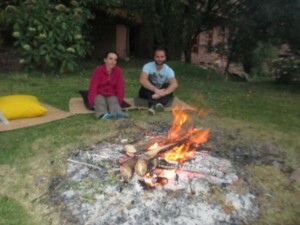 The weekend began with a Despacho Ceremony on Friday afternoon, going into evening, around a bonfire on the property of LuzMaria and Martin, (of www.nunaayni.org), the Peruvian Medicine couple, who would conduct our entire weekend. A Despacho Blessing Ceremony welcomed the five of us and asked that we state our intentions for what we hoped to gain from the weekend. Led by a Peruvian Shaman, of the Quero People, who had anciently fled to the snow-covered mountaintops to escape persecution by invading Spaniards, this ceremony bore a familiar resemblance to the one we had participated in a few days ago to mark a baby’s first haircut. Same, same; but different and led by another shaman. 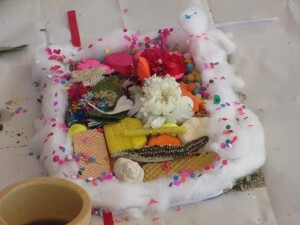 We watched as he arranged Coca leaves, sweets, powders and plastic symbols, representing important things in life, into a paper packet, which he sealed and passed over each of our bodies; and then burned, offering all represented prayers to Pachymama, Mother Earth. The lovely bonfire warmed us as the sun disappeared behind the Grandfather Mountains. Then, we enjoyed a wonderful pumpkin soup supper and went to bed very early. Martin drove three of us back to Paz y Luz. We rose at dawn and deliberately bypassed breakfast, arriving at the home of LuzMaria and Martin after walking the mile along a rutted clay road. We piled into their four-wheel drive pickup truck for the short drive to their mountain ceremonial property further down the Sacred Valley. This was achieved by a washed-out, gully of a very steep road, to a terraced scrap of land full of Incan traces: from an ancient altar, to four tombs, and many potential archaeological dig sites yielding bits of painted ceramic pottery. A Banyon-shaped peach tree and a modern folding canopy are now the major characteristics of this gorgeous river and mountain overlook. Our pop-up shelter was filled with reed mats and many huge, colorful pillows for lying or leaning upon. 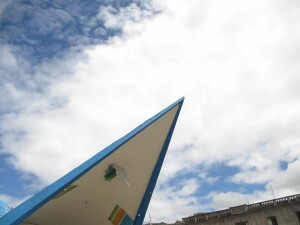 The trick was to anticipate the movement of the Andean morning sun and to try to follow the shade as it revolved around us during this scintillating day, because the sun soon became searingly hot. By this time, we are all The Sunscreen Initiated. 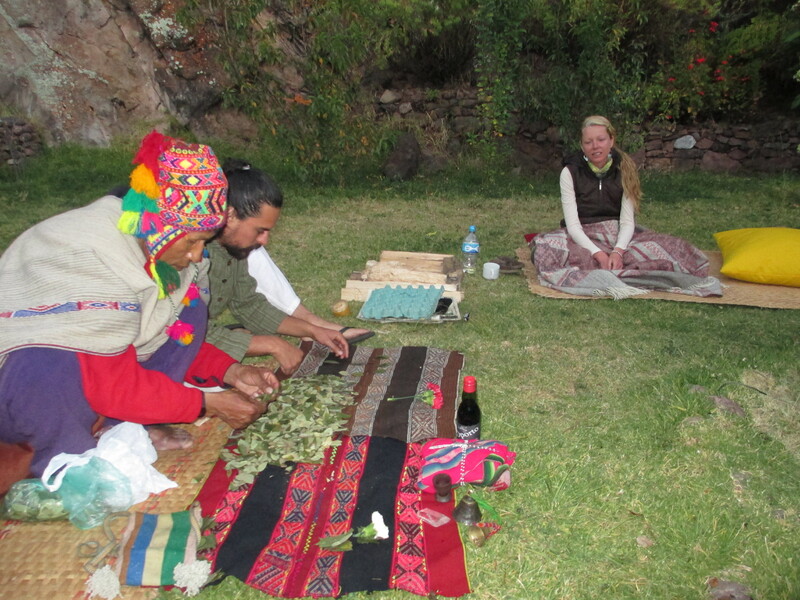 After a little explanation and prayer, our Medicine Woman, LuzMaria, passed out plastic glasses with a dose of green powder in the bottom of each. This was the San Pedro Plant Medicine obtained from a special cactus. The Quechua name for this is Wachuma, but the Spanish named it San Pedro, for Saint Peter, since they saw it as the Doorway To Heaven. This plant is said to be milder than the Ayahuasca plant, which I had experienced five years ago, on my last visit here; but that was not my opinion of it this time. I felt that it was much stronger though time has dimmed my recollection. The shaman who had led Friday night’s Despacho was not with us now and I felt we had moved from Ceremony to a Process that would unfold as it should; under the skillful watch of LuzMaria and Martin, her husband and assistant. We’d all brought water bottles and began to mix our green powder into a thick liquid, which we must drink quickly to ignore the slightly-bitter flavor; though a generous orange slice stood by for sucking if we needed to erase the taste. It was 9:15 a.m. and our stomachs were empty though I noted that all were detached enough not to gobble the orange down as if it were breakfast. Obviously, we were most-cooperative with the spirit of the day. Some of us carried pillows and pads to other shady spots in order to enjoy the view of encircling, towering mountains and to admire the many, many craggy faces, identifiable as human and animals, which are obvious in every surface of these “Grandfathers,” each of which has its own name and renown for spiritual qualities. The effect of the San Pedro herb came on gradually; progressing through the day, from slightly-woozy, to a heightened dizziness. Another possible side-effect can be purging, which is valued as a cleansing byproduct; but I don’t believe that any of us experienced that. Only today, two days later, is my body clearing itself out; making any hydrocolonics, which I had once considered doing at the next door health clinic, completely unnecessary. Having never experienced any real drunkenness, beyond being a little tipsy; and having never been high on anything…..though I don’t recall the feeling of Ayahuasca, some years ago….. I can’t compare this feeling with anything else. My brain felt uncontrollably-swimmy and my movements and thoughts were slowed; requiring more deliberation. But, I could still walk in a fairly straight line. It was harder to talk and to put together the necessary steps: say, to put away my reading glasses and locate my sunglasses in my backpack. As far as enhanced Upper World Contact, I experienced a loss of that talent. My customary, instant access to my Invisible Holy Companions was now distant and very hard to hear. This, I didn’t like but I told myself that the herb’s effect would be brief and we would soon normalize into our usual, easy communication. At that point, I clung to the hope that the San Pedro medicine was still capable of delivering some sort of trance-induced; visual effect, which was my whole reason for wanting to partake. I am Clairaudient but not Clairvoyant and I wanted to “see something Innerly” as I had with the Ayahuasca. LuzMaria and Martin beautifully played drums and flutes; and sang some wonderful, spiritual, original songs as we all relaxed into the drowsy, but consciously-awake, state within a few hours after taking the herb. 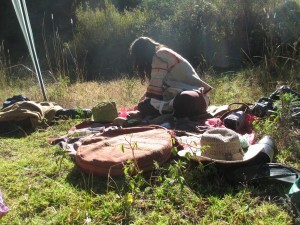 One by one, Medicine Woman, LuzMaria called us to lie in the center of the canopy while she performed an extensive psychic and shamanic healing upon the needs which she found within each of our bodies. Singing the most loving and beautiful lullabies, she passed her hands over the astral body; sometimes making physical contact and then, quite often, pulling invisible entities forth and summarily dismissing them with a flick of her fingers and a “Shwoosh!” of her breath. Martin accompanied her songs with various instruments, and often, his own soft singing. This was the most gentle and loving process imaginable. Any infant so loved, and crooned to, would indeed by a happy and contented soul to receive such mothering. But what adult ever hopes to find this? Surely, it is the soul within each of us that is being refreshed and healed. Because she is in deep trance, LuzMaria doesn’t remember, and usually doesn’t even understand, the words that pour from her mouth as she channels Entities who come on behalf of that person’s body and its healing needs. Sometimes, the vocal quality is high-pitched and youthful. Sometimes, it is elderly and wise. The tone seems to be commanding any attached, or invading, spirits to leave their occupancy of the human. Sometimes, the Voices are healing old wounds and karmic actions, which are causing sickness or pain in the reincarnated self. All of this is done through song, drumming, music and crooning love. When it was my turn for Healing, I lay with eyes closed; and thus, couldn’t see whether she made plucking movements with her hands to evict negative spirits. I didn’t hear many “Swooshing” commands, and interpreted that to mean that I must be fairly invader-free. Indeed, my health and strength are constant; perhaps because of my familiar Surrounders From The Higher Realms, Who, nonetheless, can’t make up for my obvious need for a new glasses prescription. LuzMaria later told me that she was aware of Their powerful Presences. I loved the lullabying care, which I have never experienced before. How many shamans who conduct San Pedro Ceremonies have the genuine skill of a Channeling Psychic Healer, I wonder? Perhaps not all; but my conclusion is that this Healing is the heart and soul of the San Pedro Ceremony; and not a personal-storytelling vision. No one in my group reported having that visual effect. Healing Session over, we all rummaged in our random snack supplies; truly and urgently needing those granola bars, crackers and fruit to help our shakiness and low blood sugar. We drank as much water as we could, though I still felt dehydrated most of the time, due to the heat of the midday sun. We spent the afternoon in a drowsy stupor; all unable to drift into sleep. This was to be our lot for the next twenty-four hours, though we went to bed back in our lodgings, right after sundown. Try as we might, none of us reported sleeping, even in a brief nap, until Sunday afternoon, about thirty hours after drinking the medicine. At the height of it, Saturday afternoon, my brain felt like it was on a small rowboat in the middle of an ocean. Wavy! I became impatient for that to end. Thank goodness, it didn’t make me nauseous, though that’s a valued, and valid, side effect; and a famous feature of both San Pedro and Ayahuasca. Everyone goes into this with a Spiritual, and/or Healing, objective. It is certainly not an “Opium Den” form of entertainment and does not separate a person from reality. Yes, it puts you into a super-relaxed state, but somehow, prevents sleep. A frustrating situation, indeed, though the brain isn’t buzzing along rapidly. My brain wasn’t doing much other than admiring the mountains; trying to realign myself with the ever-shifting sunlight; squeaking out a small “Hello!” to my distant Loves Above; wondering when my rowboat would stabilize…. and when I could eat something more? I was well-aware of the Outside World, throughout. At last, about 5:00 p.m., we piled back into the pickup truck and drove back to the Nunaayni Center for a delicious meal, prepared by Chef Eduardo. Food! Thank goodness! Traditional Quinoa Vegetable Soup and tiny, boiled potatoes, with crisp garlic bread. We were home in our beds by 7:00 p.m., long after darkness falls in these equatorial regions. Sooo tired! But, sleep evaded all of us, as we discovered upon survey Sunday morning. Undramatic tension in the head kept us resting, but not relaxed enough to fall into slumber. Somewhere in the wee hours of that night, I grew impatient with my swimmy brain and I forced it into calm submission through sheer willpower and some creative imagination. To my surprise and delight, that really did do the trick! I learned that I actually had the power to gain control…. …..and that may have been the greatest lesson of my weekend! I could, truly, take charge of myself, even though I knew that the agent of the annoying swoopiness was a drug that simply had to clear itself out of my system. Well, enough was enough! And fifteen hours was all I was prepared to tolerate that effect. So there!
. Upon leaving the U.S., in 2012, for my second Around-The-World, fourteen-month trek, I named stages of myself, progressing through the Hummingbird (flitting around getting ready); the Stormy Petrel (flying non-stop across the Pacific Ocean); The American Eagle, ( in American Samoa and continuing today) and The Condor (all through the rest of my life). Now, in the Andes Mountains, I’m literally in the true realm of the Condor. The Munay-Ki Rites, which I took here in Paz y Luz in May, emphasize two chakras as The Hummingbird (Root) and The Eagle/Condor (Heart). 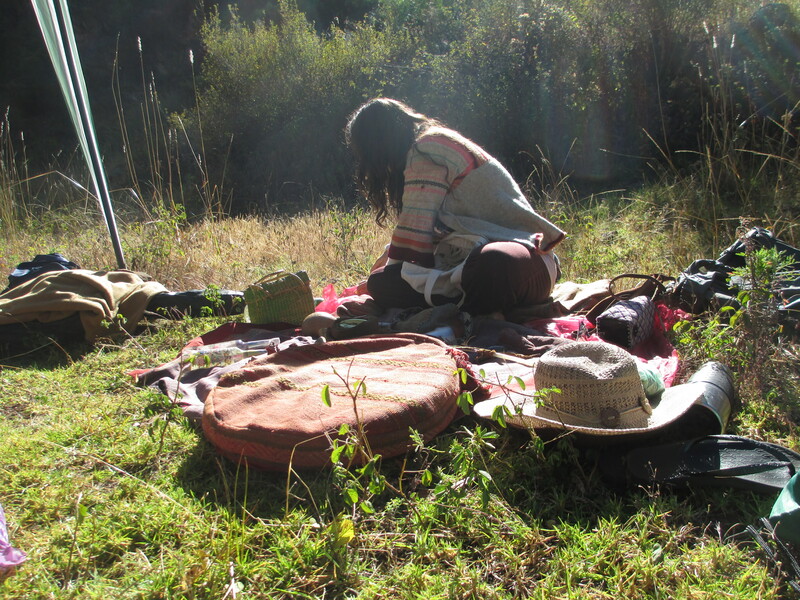 This San Pedro weekend was named “THE CONDOR’S PRAYER Ancestral Medicine Retreat/Andean Cosmovision” and that was probably the reason that I was inspired to do it. Legitimately, I knew that these fabled raptor birds were mine for the calling. And, call I did! They became my Marine Corps Troops – the two of them! As their Drill Sargent, I put them through their paces; diving and climbing as a team on military demonstration, performing sky dives in the four directions… all dedicated to the distinct and stated purpose of reclaiming my mind and driving the shrouds away. We were magnificent! We reclaimed our territory and put all on notice that these two authorities would need to be reckoned with, if there was to be any future messing with my mind. Yes, sirree Bob! After that brief and highly-inspired demonstration, delivered from a very-clear, no-nonsense, highly-focused mind, I checked on the results. I opened my eyes to study the starlight through the un-curtained window; which had been dipsy-doodle, just moments before. Absolute clarity! A normal night sky illumined the window frame. All was steady. No more rowboat! I had discovered something new! Logic told me that the few minutes devoted to my Flight Squadron was not enough to have cleared the medicine from my senses in such dramatically short order. Certainly, I have found a new and available Power within the Human Defense System, which can work miracles, if we will but employ it with all the joy and wonder of a carefree imagination. I even congratulated myself for the method chosen. Yes, it was, indeed, a military image…. but it was not used in attack. It was a peaceful, but all-out, demonstration of my own residual power and determination to be responsible for myself and my mental faculties. There could be no doubt, in any brain’s mind, that I “meant that little thing!” and would tolerate nothing less. My brain downright saluted and shaped itself up, with no questions asked! Of course, it produced a fine, full headache, right on the spot, and it couldn’t sleep worth a darn. But, I had some aspirin on hand, so didn’t complain. I had achieved my desired effect and had dreamed-up…. and lived…. my Eagle/Condor Vision. It was a very fine result, after all! 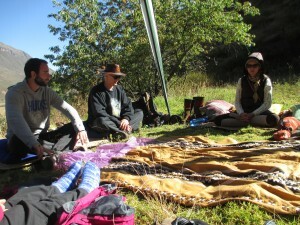 On Sunday, we gathered for evaluation and downloading about our individual experiences; two fine, carb-laden, chef-prepared meals; an afternoon nap – when all of us, finally, slept; and a mystical, musical, Sound Healing Session after dark, that was beautifully reminiscent of the day before, when Voice, Flute, and Drum pulled our senses out of our bodies and danced them in the candlelight with peace and happiness. Now, how does one describe all that? My thoughts, when I sat down to write all of this. What words can be said to pass on such an elusive and subjective experience? Always, the challenge in trying to marry the Spirit World with the Physical One; in trying to reconcile our original hopes and dreams with what we actually get. In trying to get cooperation from a beleaguered body; which may simply need a little imaginative shaping-up? There’s no photo to convey this! What, indeed? If you would be interested in participating in a similar retreat, Nuna Ayni has another Condor Prayer, Ancestral Medicine Retreat scheduled for the weekend of July 11-13, 2014. Our June gathering cost $320, which included accommodation and meals. Perhaps, July’s is the same. For information on this and all of their activities contact: [email protected] or go to their website at: www.nunaayni.org.